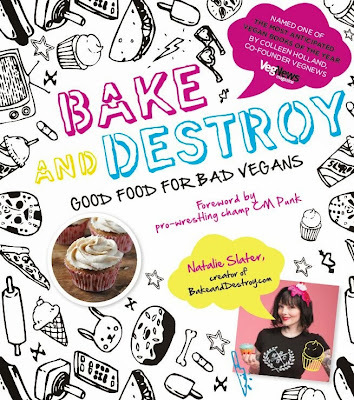 Bake and Destroy: Good Food for Bad Vegans by Natalie Slater is next on my list of books to review for y'all. (I know I have been doing a lot of reviews lately, and I promise to get back to posting my own stuff soon, but there are so many awesome books out right now!) I was super excited to be a part of her Blog Tour, and the publishers were kind enough to send me a review copy, but guess what? I already bought my own copy, because, duh, why wouldn't I? So, I now have an extra copy to give away to one of you lucky readers! Simply follow the prompts in the widget below to enter. Sorry, this one is open to US and Canada residents only. Okay, seriously? Can we please just stop now and talk about how damn cute this book is? Just look at the cover! Those adorbs little drawings are all over this book. And the photos? Most are taken by the ever amazing Celine Steen, so you know those are super fantastic. There is a full color photo for almost every recipe, and the chapter openers have not only a photo, but more of the adorable drawings superimposed on top of them. The fonts are cute, the cover is cute, the drawings are cute, the recipe titles are cute, even the flippin' author is cute. So, yeah, this book is really fun to look at. But looks aren't everything, even though we do eat first with our eyes, the food has to taste good once it enters our mouths. And Natalie delivers the goods. The recipes are stellar with "comfort food" just barely scratching the surface when it comes to describing the style of food she presents in the book. Recipes for Chick-o-Cheesecake (page 37), French Fry Tacos (page 95), Pretzel Dogs of The Dead (soft pretzel wrapped hot dogs, page 131) and Deep Fried Cream Corn (page 165), this lady really knows how to woo me with recipes. There are so many sticky notes in this book, I may as well just make the ones I haven't bookmarked yet, as that would be much easier. The layout of this book cracks me up. Foreword, one page by pro wrestler CM Punk. Intro, one page. Then BAM! Straight to dessert. 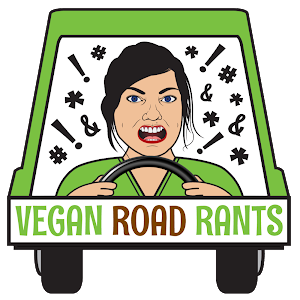 No fussy chapters about what ingredients you should stock in a vegan pantry, or what the difference between soy sauce and tamari is. Nope. Straight to desserts. Though, there is a handy chapter in the back of the book, Chapter 6: Tips, Tools and Magic Tricks, that does address these very important issues. And I will tell you when I first opened this book (Remember, I take them into the bathtub to read like romance novels.) I had no idea there was anything but desserts in the book...I mean it is titled "Bake" and Destroy, and Natalie is known for her cupcakes, so imagine my surprise when I found all of the savory stuff! This book is so fun to read, and easy to use. Buy one for yourself, and then buy at least two to give away as gifts to non-vegans, because if this book doesn't make the most skeptical of carnivores at least seem tempted to try out some vegan food, then we are doomed. Natalie was kind enough to share one of her favorite Halloween recipes with you, and it is now one of my favorites too. I mean, who wouldn't love dessert all dressed up in a salad costume? 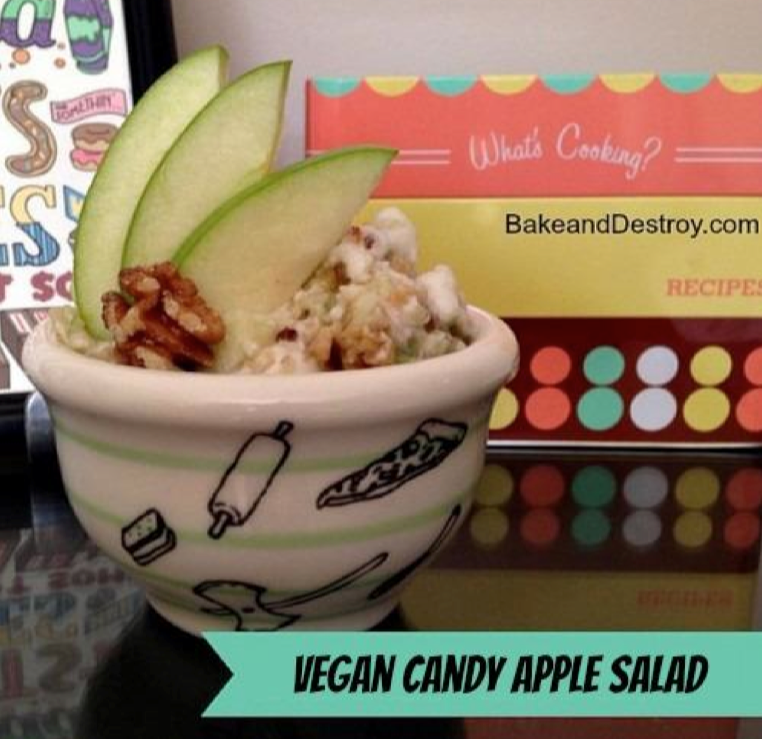 The non-vegan version of this sweet and salty salad is a staple at my family’s get-togethers. Feel free to substitute red apples if you prefer, and to use salted peanuts in place of the candied walnuts! I was fortunate enough to get my hands on some Dandies mini vegan marshmallows for my batch, but you could chop up your favorite full-sized ‘mallows to get the same effect. The day before serving, place the cans of coconut milk in the refrigerator overnight. The next day, carefully turn them over and open the bottom. Pour out the water, and place the thick cream that’s leftover into a mixing bowl along with the confectioner’s sugar and xanthan gum. Use a handheld electric mixer to beat the cream until it’s thickened. Gently fold in the vanilla extract and refrigerate until ready to use. To make the candied walnuts, preheat the oven to 350 F and lay the walnuts in a single layer on a baking sheet. Bake for 5 minutes, stirring them after about 3 minutes. If they smell nutty and toasted, remove them from the oven and transfer them to a plate to cool down. If they aren’t toasted yet, keep baking them for 1 minute intervals, taking care not to burn them. Pour the sugar into a saucepan and cook over medium heat, stirring with a wooden spoon until the sugar begins to melt. Make sure the toasted walnuts are close by. Keep stirring until the sugar has melted and is amber in color. Then turn the heat off, and quickly stir the walnuts into the melted sugar. Immediately transfer the coated walnuts to a baking sheet covered with wax paper or a silicone baking mat. Spread them out, working quickly, so they can cool. Use two forks to separate them, if necessary. Sprinkle with salt and allow to cool completely. Serve immediately, or chill for a few hours and serve the same day. Because the marshmallows do not contain gelatin, the moisture from the other ingredients will break them down and make them fairly sticky after about 2 days in the fridge. I love, love, love candy corn. Or at least I used to before being vegan. I've been hearing SO many good things about this book. The Candy Apple Salad recipe just might get me over my strange fear of purchasing xanthan gum! I don't really have a specific Halloween favorite dish. But around this time is when I start making sweet potato cheesecake, cause I don't like pumpkin. Caramel apples all the way. Roasted Pumpkin Seeds. Not only do you get the fun of carving a jack'o'lantern, but you get one of the best snack foods ever afterwards. This looks amazing and love the Misfits quote to start it off! Candied Apples. 100% of the time. roasted pumpkin seeds or Isa's Zomberoni Pizza I cannot decide! Well it's not very unique but I always link it to Halloween, especially when turning it orange, but my favorite Halloween food is scary orange rice crispy treats. I can eat the rice cereal, so really not that scary. Thanks for the giveaway and recipe. The last couple of years I've really enjoyed apple cider cookies with apple cider glaze. 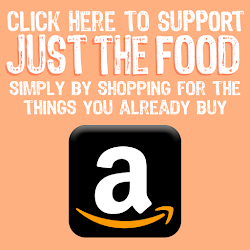 I love vegan pumpkin pie, apple cider doughnuts, or homemade candy corn! 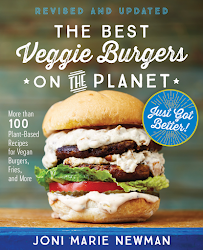 Would love to win this cookbook! definitely the roasted pumpkin seeds. I can't stop eating these :) At least they are healthy! I love making just a simple mulled apple cider. That looks sooo good. My fav halloween food is skeleton cupcakes! I have never thought of Halloween food outside of candy....I guess my favorite fall food would have to be apples. Apple butter, apple sauce, straight up apples, dried apples...any kind of apples! Caramel apples is my favorite! Anything with pumpkin :) or apples! Fall is the best. Thanks so much for the giveaway! Our Halloween tradition is spiced cider and a big pot of chili. Good food for bad vegans? That's awesome. I love hot apple cider during this time of year. And, of course halloween cupcakes! I remember apple cider and donuts was always the tradition for Halloween night in my family. I can't even recall the last time I had a donut, but I do have some apple cider in the fridge. Yay, thanks for this! I swear, vegan marshmallows are way better than the originals. I'm going to put this recipe on my to-make list, as I plan on having a mini Halloween vegan treat bash! I am a big fan of candy corn and pretty much anything naughty. Chocolate/peanut butter. Reese's signified Halloween for me, so glad Justin's are available! Really impressive work thanks for share this. [ Smiles ] Great! A lovely vegan desert!